This is a short but very steep hike. If memory serves, we started at 5600′ after a longish drive up from Mazama, and ended at 6800′. My valley floor lungs were suffering. But, despite the warm weather of late, at that elevation and fairly early in the morning, it was not really hot. That’s the lookout on the left, on top of the peak in the foreground. The mountains are in the North Cascades to the south and west. 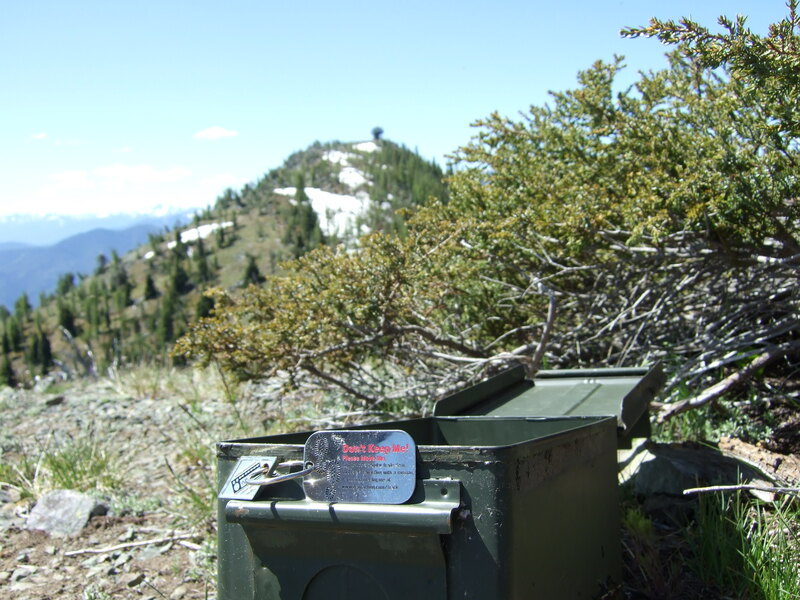 We did not continue the final 1/2 mile or so to the lookout, since there were still significant snow patches on the north-facing side of Goat Peak, and we had achieved our other goal, which was to deliver a “travel bug” to its final destination in a geo-cache near the peak. What is a travel bug, you might well ask? Welcome to the world of geo-caching – I still have a lot to learn! Here are the Travel Bug FAQs, but basically it is a trackable tag that is attached to an item and logged into the Geocache.com website, so that it “becomes a hitchhiker that is carried from cache to cache (or person to person) in the real world and you can follow its progress online”. This particular travel bug originated in Chicago, and it took 3 years for it to reach its defined goal, which was to go to Lightning Bill! 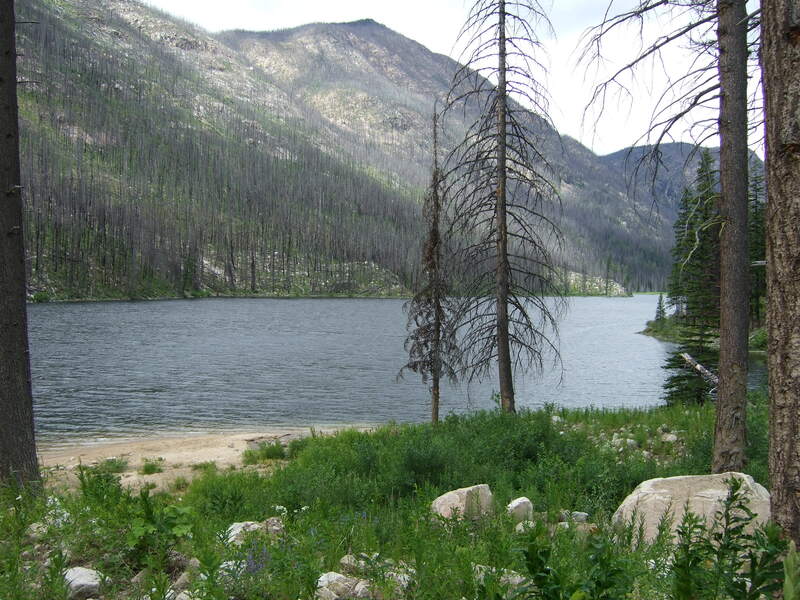 This week, yesterday actually, four of us made it to Black Lake, which is a 5-mile hike up the Lake Creek trail in the Pasayten Wilderness (accessed via West Chewuch Rd out of Winthrop). 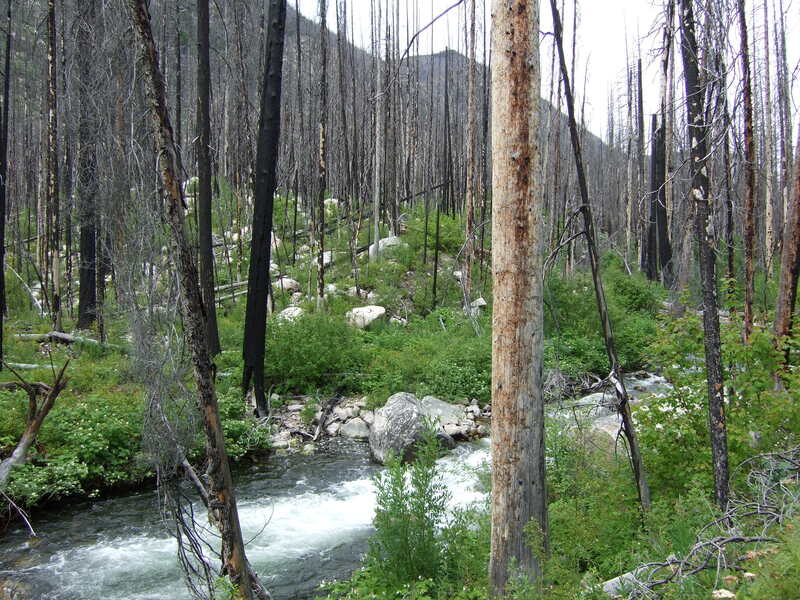 Our group thought this hike is in the area burned in the 30 Mile Fire back in 2001, but this trip report from the Washington Trails Association website says it was actually burned in the 2003 Farewell Fire. It also says it is only 4 miles. Hmmm… felt like 5 miles! Anyway, the trail has little elevation gain and follows along Lake Creek most of the way. Despite all the burnt trees, it did not feel really desolate, since a lot of the understory is coming back. In fact, the trail could use a good brushing-out! After the very hot temperatures of last week, we were glad it had cooled off, and we had high overcast as well, so what could have been a long and hot hike was simply a little long. But it felt good to get out and get that much exercise! And to our surprise, there were really NO BUGS – amazing! It was actually kind of cold and windy at the lake, enough so that we had to put on our windbreakers to eat our lunch.